For roughly fifty years, the Old Faithful Antique Fire Engine Association has been giving fire engine rides in New Canaan, CT to children of all ages, often in support of many local social and civic causes, educational and religious fundraisers, but also at private parties like birthdays and weddings. Some of the most popular events repeat every year, like St. Mark’s Strawberry Festival, New Canaan Country School’s Frogtown Fair, and the Nature Center’s annual Fall Fair. New Canaan's Memorial Day parade would be bereft if Old Faithful failed to participate. So, exactly what is Old Faithful? Old Faithful is a registered non-profit organization. It never charges for its services. Rather, donations from the membership and the public at large finance its activities. Membership is open and new members are warmly welcomed. Mechanical skills are most helpful, but there is always plenty of work for those lacking special skills. Driver training has been handled internally under the supervision of highly competent officers from the Fire Company. The safety of our passengers is paramount and our record for safe driving is unblemished. The Old Faithful Antique Fire Engine Association consists of two valuable assets. One is a group of mostly New Canaan residents, many of them past or present members of the New Canaan Volunteer Fire Company but includes people from all walks of life. The second is four antique fire engines, fully restored and maintained by our members. Two of the engines, a 1922 Seagrave pumper and the 1953 Ward LaFrance, were in active service in New Canaan and have intrinsic historical value. 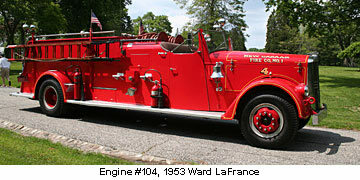 The Ward LaFrance actually replaced the Seagrave in 1953. Since being taken out of active service in the early 1980s, it has had its tank and hose bed removed and the space converted to hold benches for the safety and gratification of the people who revel in riding in it. The mission of Old Faithful has evolved throughout the years as the organization has grown. Initially the personal interest of several fire-engine buffs, the mission was initially to acquire and restore old trucks. Some money was needed, plus lots of storage space, together with the mechanical talents to fix the engines and refurbish the rusted bodies. Additionally, individuals hire Old Faithful for weddings, birthday parties and family reunions, usually using Engine #104 and on occasion Old Faithful itself. In recent years, a variety of charitable organizations have discovered the joy of auctioning off a “gift certificate” for an Old Faithful ride to the highest bidder at their fund-raiser. Old Faithful is normally happy to acquiesce to such requests for our services, though in these situations, of course, Old Faithful receives no remuneration. That is our story. Old Faithful will continue its charitable, social and civic activities as long as we enjoy broad community support, financial independence and an infusion of new members from time to time as needed. We extend a warm invitation to you to come and enjoy these grand old fire engines with us.